Hampshire County is somewhat unique among West Virginia counties in that it has a very extensive colonial history commencing sometime in the first half of the eighteenth century when settlers began to move west from the Shenandoah Valley into the Potomac highlands. Among early settlers was James French who received land grants from Thomas, Sixth Lord Fairfax, for land along the Little Cacapon River. One of the grants for 225 acres had originally been surveyed by George Washington for Robert Crapper who did not live long enough to obtain title. The grant was made instead to James French, Crapper's son-in-law.1 With this parcel and another one near the confluence of the North and South Forks of the Little Cacapon River, James became a prominent citizen at a very strategic place. Sometime after James French received the grants, the original Great Wagon Road from Winchester to the South Branch moved from going up the hollow of Shawan Run at present Barnes Mill and instead turned south along the Little Cacapon to join the road from Augusta to Romney. This Augusta-Romney road became the Northwestern Turnpike in the 1830s. Thus, from the French property at the fork of the Little Cacapon one could go west to Romney and Keyser, east to Winchester, northwest to Cumberland and northeast to Paw Paw and Martinsburg. Because of this prominent location the community that sprang up, Frenchburg, became by the Civil War one of the larger communities in Hampshire County (see map page 4). 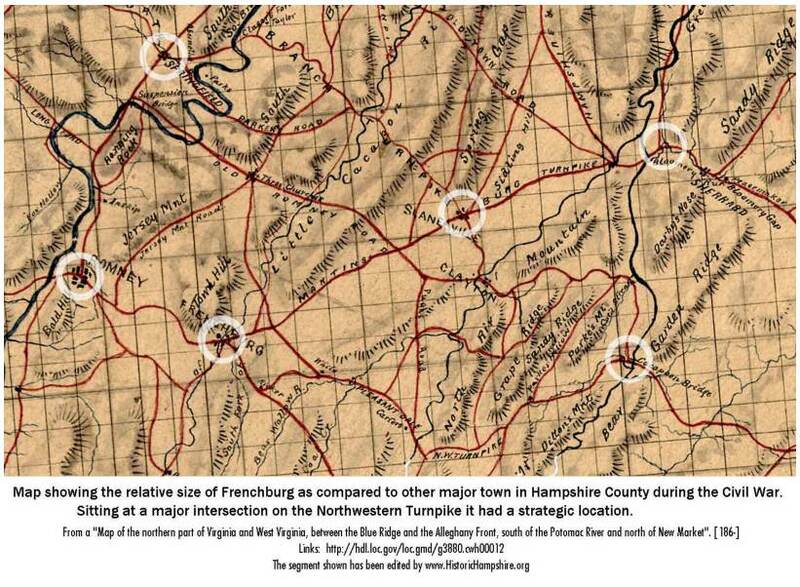 The community of Frenchburg was one of the areas in Hampshire County that suffered greatly during the Civil War. In fact, it was destroyed and never recovered to become a town by any measure. Because Union troops were stationed in Keyser and Piedmont in what was then the western edge of Hampshire County and Confederate forces for some time held strong positions around Winchester, the Northwestern Turnpike through Frenchburg was of vital importance. Its location on a route north to the B&O Railroad made it even more strategic. 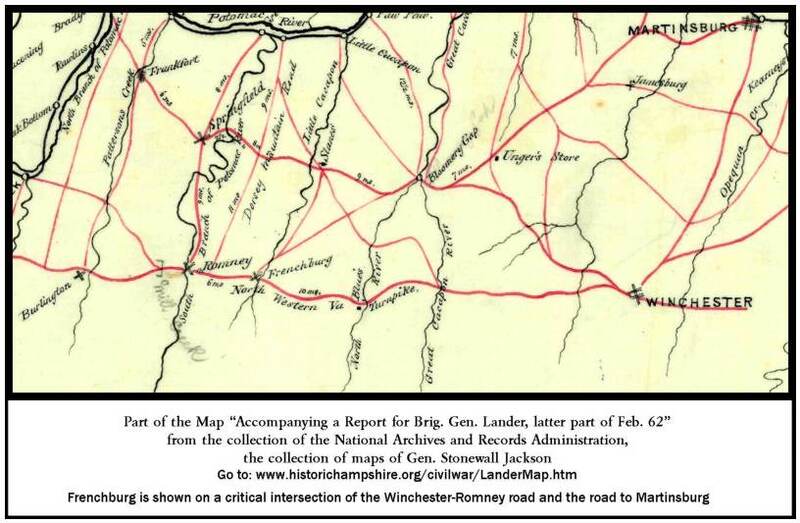 "They advanced fifteen miles on the sparsely settled road leading from Romney to Winchester. The Captain of a Jefferson company stated to our informant, that on that road he counted the smouldering ruins of thirty-nine houses — burnt, not in the retreat, but in the advance of the invaders some weeks before, when there were but a few militia to dispute their progress. Not only were the houses and barns burned, but all the stock was killed. Frenchburg had been the site of a general store at the beginning of the war and for a brief time before the war it had a Post Office which was moved to the Augusta area. There was a mill nearby. However, after its destruction during the Civil War it never fully recovered to be considered a center of commerce or society although later there was a cannery and wagon shop nearby. It is appropriate that the new bridge to be constructed over the Little Cacapon River at the site of the old community of Frenchburg be named for that lost town. It would be a fitting monument to a place where George Washington had surveyed and early settlers began making their homes in Hampshire County. It also marks an important junction of early roads that contributed to the transportation of goods and services around the growing county and which later became a stopping place on the important Northwestern Turnpike. It is also a reminder of the cost of war in the "State Born of War" and a reminder that Hampshire County has a Civil War history much different from most of the counties of West Virginia.